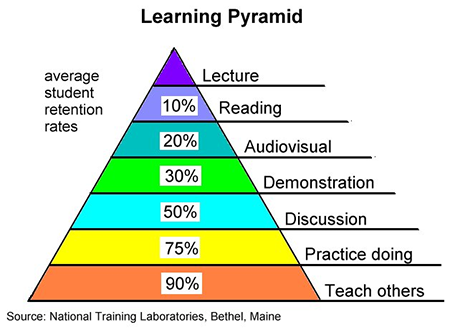 I came across this pyramid at Jan Schultink's blog. Ignore the percentages and just look at it as a hierarchy (an order of effective to less effective). We (and that includes our audience) learns most by teaching others. This is followed by practice, then discussion and finally lecture. What does this mean for presenters like us? If we lecture in our next presentation our audience will not remember much. If we add a bit of demonstration, the learning will become better. Demonstration reminds me of Steve Jobs. In most of his presentations we find a demo. There is something else we can do; Discussion. When we discuss a topic with our audience, they learn more than when we give a one-way lecture. I feel this is a significant point. If we can move from one-way communication to a two-way discussion, our presentations will become more effective. 2nd phase:- I know what I do not know. It is very interesting though I don't see a direct connect with the pyramid. The phases you have mentioned are the phases one goes through as a learner. The pyramid is from the trainer's perspective and tells us what the audience will learn and remember more.